This is my third year with the swans and my second ANZAC friendship match day involvement. Its a great day all round for families and footy lovers. 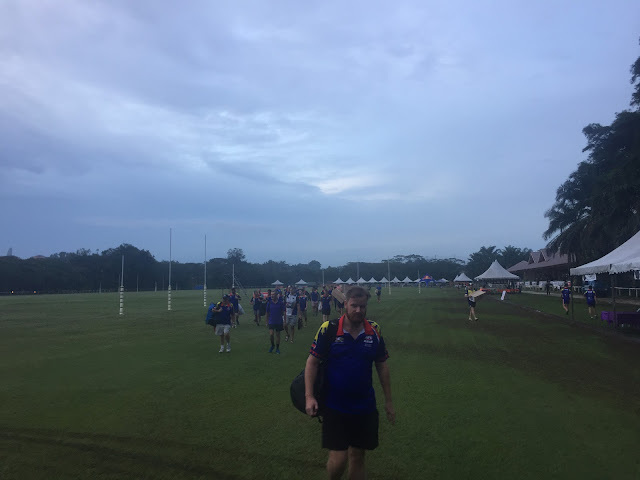 For a full report on the main match and the clubs great work please visit the Swannies site HERE. 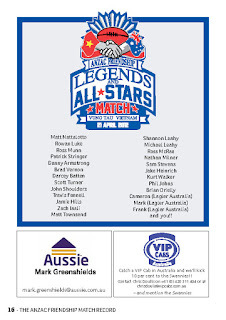 Since my injury in 2010 the only football I have participated in is the annual the Legends Vs All Stars match. This fantastic concept allows many of us who are not in the firsts to pull on a swans jumper and get a few kicks. It is always played in great spirits and there is plenty of laughs. Saying that - we put in a good effort and 100% is expected from all players. This years match started with the ALL STARS executing a perfect centre bounce tap, clearance and pass straight onto the [not insignificant] chest of Kyle 'Blocker' Hackenberg. Kyle duly converted and the signs looked good for the ALL STARs. Enter Danny Armstrong. The one time Swans first pick, forward, ruckman, age defying LEGEND had other ideas and as soon as he he got a sniff Danny didn't let his team down. The LEGENDs answered with 3 very quick goals and turned the game on its head. With the heat of the day at its peak now, the ALL STARS steadied and added a second goal shortly before the first break which limited the LEGENDS to a 1 goal 1/4 time lead. The game was played with a good level of intensity throughout the second quarter and the ALL STARS managed to regain a slight lead into half time. Youngsters Nathan and Quy were particularly good for the ALL STARS and their centre bounce work was invaluable. I managed a couple goals, Kyle continued to menace down forward, Alex Polson was also starting to win the ruck although long time Swannies veteran Paul Koch was winning his own share of taps for the LEGENDs. Swans veterans Matt Townsend, Shannnon Leahy, Peter Roche and Sam Stevens all played very well and threatend to break the game open for the LEGENDs. At half time the ALL STARS were asked by coach MJ if they wanted to play just 10 minute final quarters or continue with the 15 minute format. With many guys not completely match fit the initial vote was a majority in favour of 10 minutes. With that, I decided to interrupt our coach and mentor for the day MJ, and ask the team "why they would opt for an easy option when this may be the last and only time they ever play on this ground". I suggested many of them would have great pride in reciting this day to their family and friends in the future and expressing their great pride in playing for the swans ALL STARS team. We voted again and a unanimous count concluded we would play out 15 minute quarters. This gave me and I think most of the team a new burst of energy. We pushed hard in the third quarter and consolidated our lead. The LEGENDs kept in touch right through but a 3 goal ¾ time buffer was enough for us to hold on to victory. WIN, LOSE or DRAW the game is an out and out triumph! Final scores were barley even acknowledged as the two teams came together to congratulate each other and thank their team mates for the small part we play in today’s event. Well done SWANS on another great ANZAC friendship match day event. See the team sheet and download the record. The boys always have a great day!